Doors open 7:00pm for curtain at 7:45pm. Food will be served on arrival. 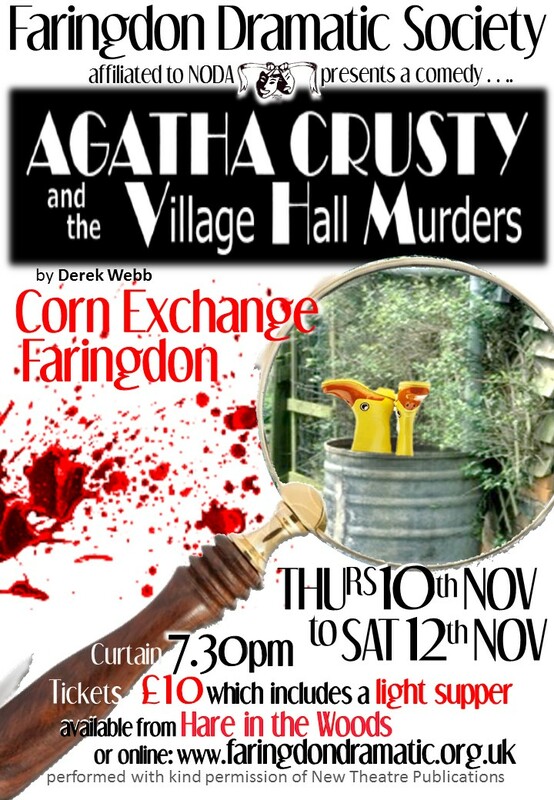 As food has to be ordered in advance, tickets if still available on the door (£8) will NOT include food..
“Agatha Crusty” (pronounced Croosty) is a crime novelist. She’s also pretty adept at solving crimes. 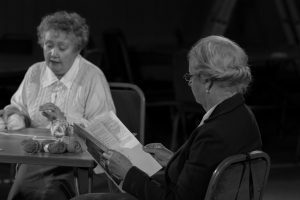 And when her sister-in-law Alice invites her to spend a few days with her in the village of Chortelby, it’s not long before she gets caught up in a series of murders which seem directed at members of the All Saints Village Hall committee. From Toby, the Vicar, and Eleanor, Chair of the committee, to Harry Knott the caretaker and identical twins Olivia and Oliver Truscott-Pratt, there are plenty of suspects. And with an investigating officer as incompetent as D.I.Twigg, there are plenty of laughs as the murders begin to pile up. 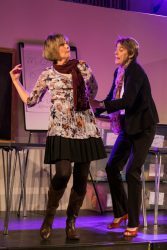 If you are visiting here to write a review then please click on the button to the right or use the arrow buttons to see the reviews for other performances. 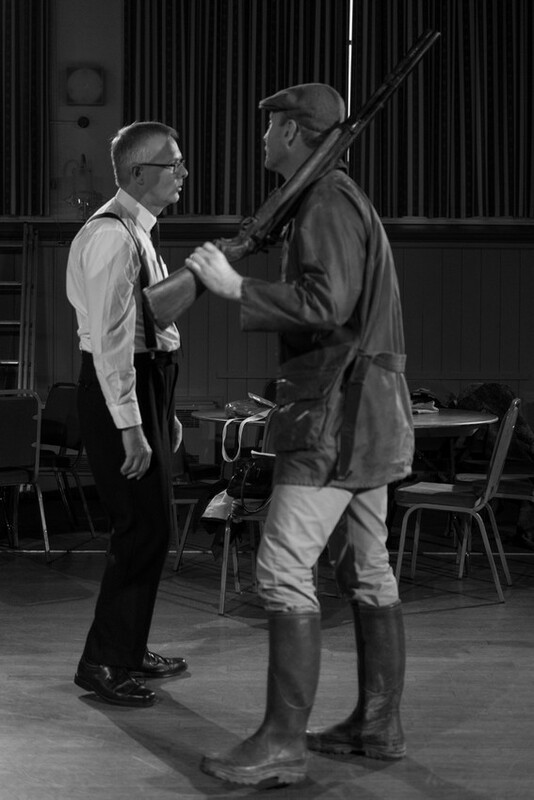 Many thanks to all those who have written a review for this production. "My attention was held throughout the performance"
Hard to believe this was an amateur performance, so impressed by all the actors. Nice to see a fun filled performance. 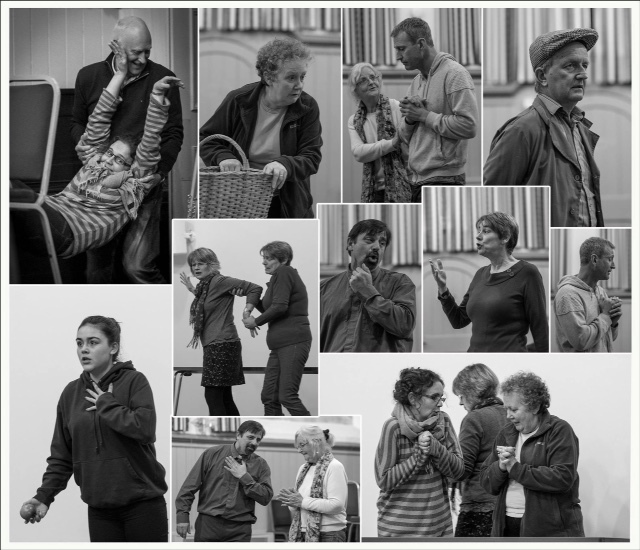 The Corn Exchange was a great venue and it was easy to see and hear all the actors. Having food beforehand worked well too. Will definitely come to see future performances. Great way to spend an evening. 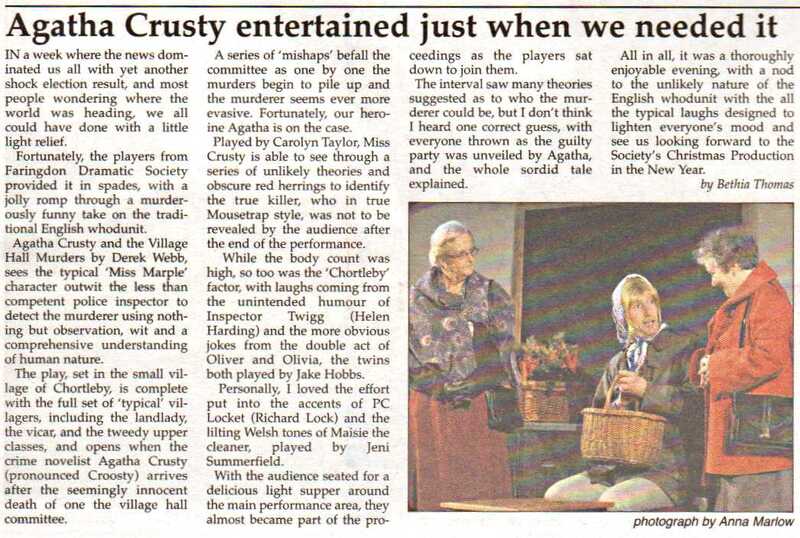 "Cracking whodunit plus a crusty"
What an excellent evening's entertainment. The supper theatre format worked really well for us – just like being back at Islington's King's Head. 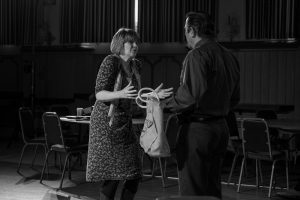 Moving the action of the play amongst the tables was very effective too and we'd be happy to go to another show in that format. 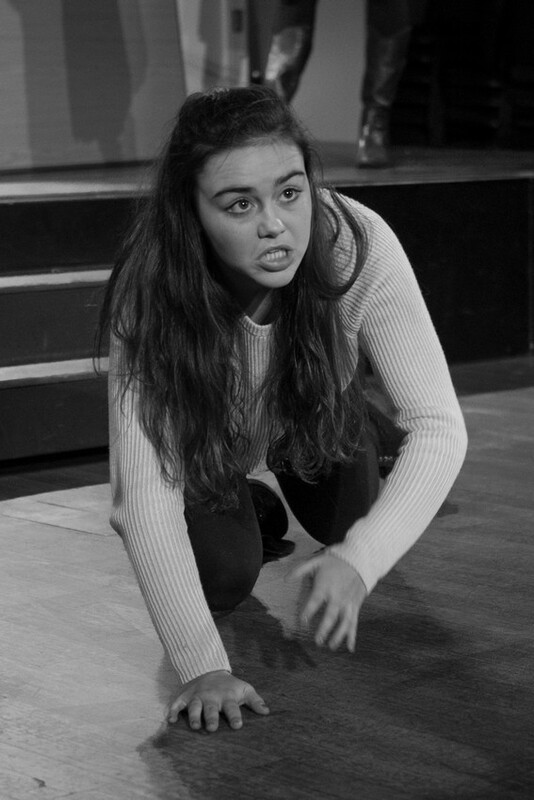 Acting, production, costumes and all were, as ever with FDS, top notch. "An enjoyable evening in the round"
A very well organized ploughman's supper with a good selection of fresh and tasty food. 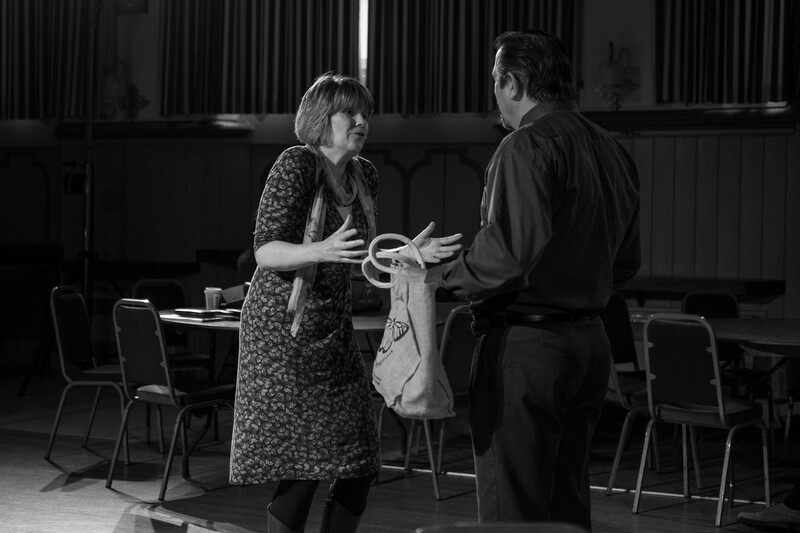 Tables, chairs and bar created the right setting for a mystery set in a village hall. The quickly changing scenes kept the action moving with Part 1 and 2 being well balanced for time and content. We were kept guessing as to who was the most likely or the least likely murderer and had no idea why. The motives and opportunities were cleverly presented by Inspector Twigg and the cast engaged well in their roles, providing humour and seriousness in good measure. The ability of all the players suggested that many roles could easily have been swapped around. We returned home with a 'good night out feeling' for which we thank all the on stage and behind the scene's members of Faringdon Dramatic Society. "Very tasty ploughman's as a starter and only surpassed by the super main course - a murder mystery"
The performance was excellent especially as the actors & actresses were within touching distance of some of us. The casting was perfect and costumes fitted each person's character perfectly. Sitting around the performance made it more intense and extremely brave of the performers, I think. The scene changes were cleverly disguised and perfect timing. My only issue was that it was difficult to hear at times, especially with the performers constantly moving around. I did think though, that had they worn head microphones each it would have detracted from their characters. I thoroughly enjoyed the whole evening and, as usual, I had a 5* evening. Many thanks. "Good evening out in Faringdon"
The performance was good, some jokes a bit naff. 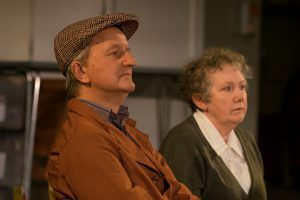 The detective was excellent and Agatha Crusty played a convincing role. Costumes in character and set reasonable. (The writing on the blackboard was too small and written in a pen too pale to be readable.) Seating arrangement round the hall gave good views to all. The hall was cold because all the heaters had been turned off. The ploughman's was superb. All in all a very good evening out and excellent value for money. 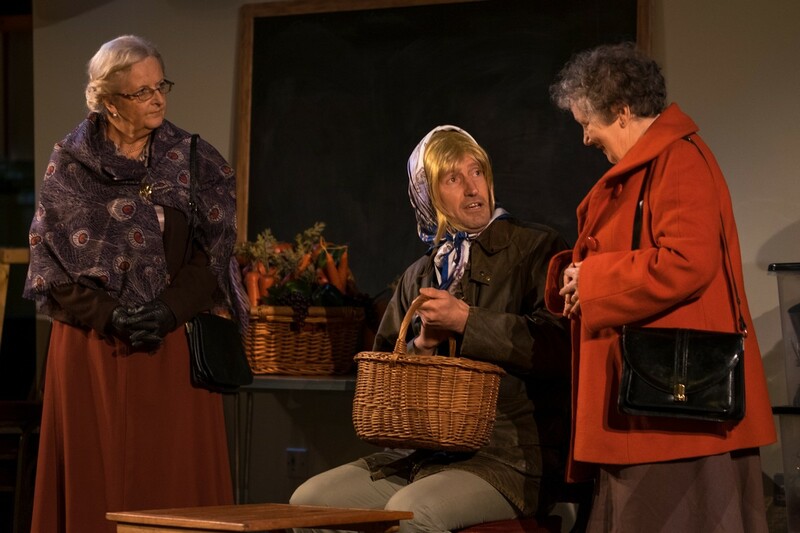 We had a very good Ploughman's Supper and watched a very funny play, well acted.